If you have stage 5 chronic kidney disease, otherwise known as end-stage renal disease, you need a kidney transplant or regular dialysis to stay alive. Dialysis cleans and filters your blood when your kidneys no longer can. There are two different types of dialysis — hemodialysis and peritoneal dialysis. Read on to find out what type of dialysis is right for you. Dialysis removes waste and extra fluid from the blood, just as your kidneys would if they were fully functioning. The two main types of dialysis, hemodialysis and peritoneal dialysis, filter your blood via two different filtering processes. Although dialysis, often done at least three times a week, can be time-consuming, you can still lead a happy, healthy life while on treatment. Learn more about the different types of dialysis below, then work with your doctor to decide which type will work best for you. 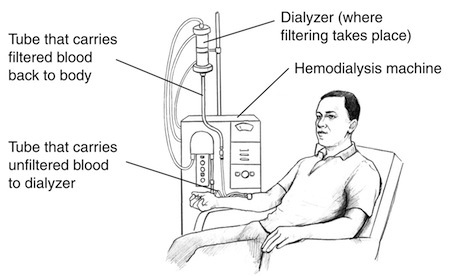 Hemodialysis uses a dialysis machine to filter your blood. Blood is taken from an access point – usually a fistula in your arm – and sent to the dialysis machine in a tube, similar to donating blood. Once waste is removed and the blood is clean, it is returned to your arm using a different tube. Hemodialysis can be done in a center or at home. Patients dialyzing in-center will typically receive three treatments a week, with each treatment lasting about four hours. If you choose to do hemodialysis at home, you will probably do one of two schedules — five days a week, for two to three hours at a time, or overnight three days a week. Peritoneal dialysis, often called PD, uses your own body for filtering rather than a machine. To get ready for PD, a surgeon will place a semi-permanent tube into your abdominal cavity. During peritoneal dialysis, a clean rinsing fluid is sent through the tube and into the abdomen, where it is allowed to dwell for several hours. During this time, it removes waste and extra fluid from the blood. This fluid is then drained out through the same tube. This process, called a PD ‘exchange,’ can be done by hand or overnight with the help of a machine. After undergoing training by our staff members, you’ll be able to administer your own PD at home or at work. Peritoneal dialysis is usually done daily, at home or at work, making it a great option if you have a busy work schedule or stay at home with your kids. Another advantage of PD is its equipment is portable, giving you more flexibility and freedom to travel. Dialysis treatments take time, so it’s important that you choose the type of dialysis that fits best with your schedule. Talk to your doctor to decide whether hemodialysis or peritoneal dialysis is right for you. Although some people start dialysis treatments in a hospital, most move to either dialysis in an outpatient center or at home. 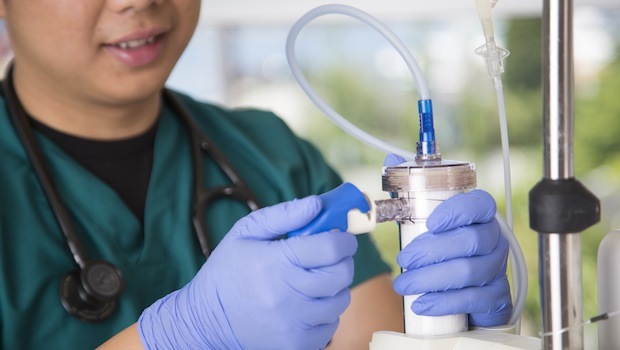 Learn more about the different places you can dialyze to figure out which one you’d like to pursue. Patients receiving hemodialysis treatments can dialyze in one of our six centers across the Puget Sound region. With typical in-center dialysis treatments lasting four hours and done three days a week, it’s important you feel content and comfortable throughout your treatment. Bring your laptop or tablet and connect to our free Wi-Fi, pop in your headphones and listen to your iPod or bring a magazine or book to read while you dialyze in our comfortable recliners. Or, you might decide dialysis at home is right for you. Following training by our expert medical staff, you can choose to complete either hemodialysis or peritoneal dialysis at home. Your kidney doctor, or nephrologist, will work with you to decide if home dialysis is right for your current health and lifestyle. The benefits of home dialysis include greater independence with your treatments and less restrictions on diet and fluid consumption. Other than some discomfort when the needle is put in, you shouldn’t feel any pain during hemodialysis. The same is true if you choose peritoneal dialysis. You may feel full or have some very mild soreness in your back following treatment but nothing overtly painful. Low blood pressure is one of the most common side effects of hemodialysis. It’s more common in patients who also have diabetes and it can leave you feeling nauseous and short of breath. Speak to your nephrologist or your care team to see if you can take medication to help prevent this. If PD is done in a clean environment, as instructed, the chance of infection is low. However, an infection at the tube location (near your belly button) is possible. Treatment usually involves a course of antibiotics so let your doctor know right away if you are feeling unwell. In general, if you follow your dialysis team’s instructions — especially in terms of diet and medication — you will feel well during treatment. Like most medical treatments, dialysis is expensive. However, federal funding usually covers 80 percent of dialysis costs. Speak to your social worker for more information and, if you have private health insurance, contact your provider to see if dialysis is covered. Can I travel if I’m on dialysis? Yes — as long as you aren’t having any complications with your treatment then you can travel while on dialysis. If you dialyze at home, you can bring portable dialysis equipment with you or, if you dialyze in a center, you can arrange to dialyze at a center near where you are traveling. Simply speak to your doctor and social worker to make arrangements. 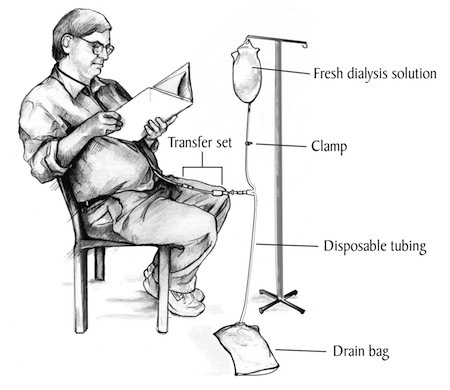 Find out more about traveling on dialysis. Yes, many dialysis patients continue to work while on dialysis. There will likely be a period of adjustment to your new dialysis schedule, particularly if you dialyze in a center, but if you feel well enough then there is no reason you need to quit your job. Work with your care team to set up a dialysis schedule that also suits your personal and work agenda. How long can I live on dialysis? Although dialysis is tough on your body, you can live for years while on it. While on dialysis, there’s plenty you can do to help extend your lifespan and live a happy, healthy life. Read more nutrition information and get fitness tips, then work with your doctor to make lifestyle changes that keep you feeling well while on dialysis.